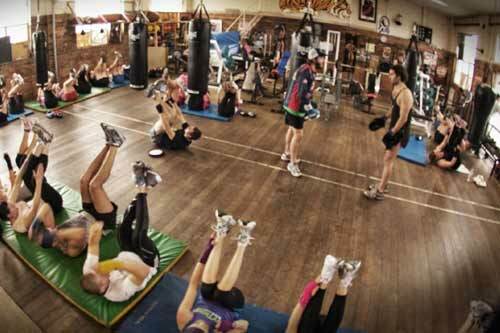 Leo Berry's Gym - Richmond Boxing Club runs the Berry’s circuit classes from 6.30pm-8pm Monday and Wednesday evenings and 8.00am-9.30am on Saturday mornings. The circuit goes for approx 1.5 hrs, and uses a combination of exercises that incorporate boxing skills (such as bag and pad work) with traditional fitness training. The sessions are easy to follow, with multiple trainers always on hand to look out for beginners. You are welcome to come down at any time and watch a session to see what you think. During your training session you will go through a variety of fitness and boxing specific exercises in our fully equipped training area. We will provide you with boxing gloves (although it is recommended to bring your own if you have them), bags, skipping ropes and a space to push up, jump and squat until you think you're about to collapse. As a result you will be rewarded with strength and stability, impressive hand-eye coordination, greater anaerobic thresholds and mental toughness. It also comes with a wonderful feeling of accomplishment. Our circuit trainers are elite specialists in their field; distinctive and invaluable in their ability to combine great boxing and people skills while having a real interest in your training.